Internal Mounting frame for 2x 2.5" SSD/HDD in a 3.5" Bay. Material: Aluminium. If you have two SSDs available, but no proper mounting place in order to add it to your PC, the IB-AC643 can be helpful. 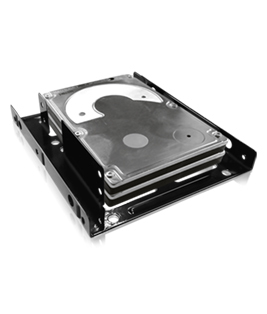 This practical metal mounting frame can contain up to two 2.5" HDDs or SSDs in just one 3.5" bay. One of the main reasons for short HDD life span is over heating. The frame is made of heat conducting full metal and additioanlly provides a possibility to mount an 80 mm fan on the bottom (not included in the package). 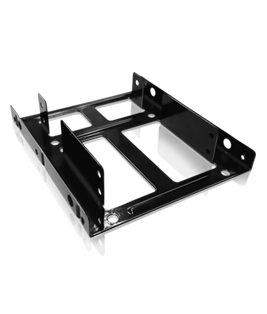 Thanks to it's compact size this frame can be installed almost anywhere, even in small media center PCs. Festigrind fyrir 2x 2.5" SSD eða HDD diska í 3.5" stæði.